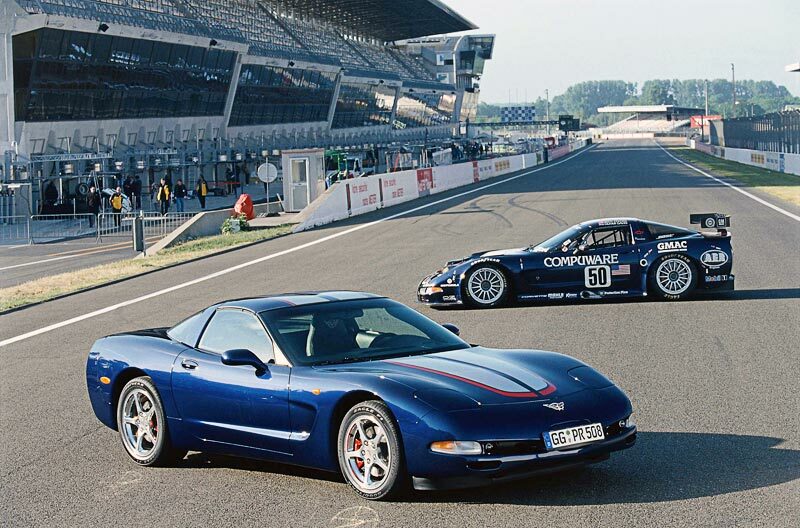 Special C5 Corvette race cars (below right), with the designation of C5-R had seen consistent success in the most demanding race, the 24 Hours of Le Mans. This was a factory effort which had resulted in podium finishes (third place or better) in the last 29 races and victories in the last 20 races. 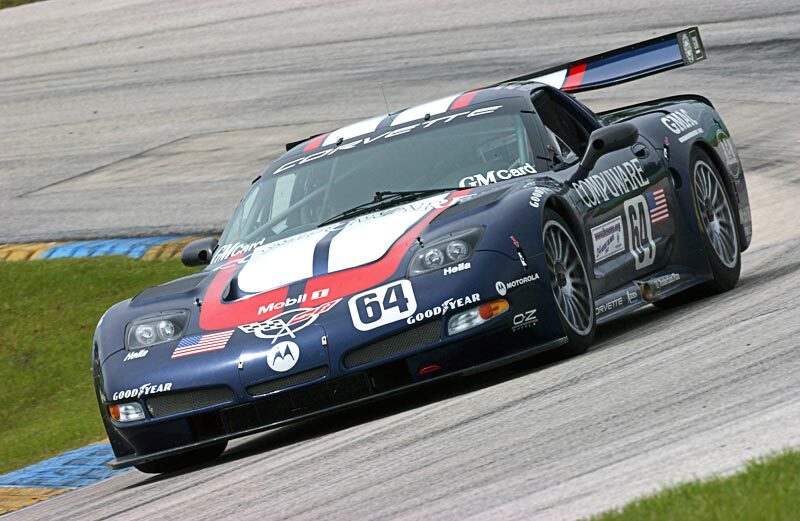 A special Commemorative Edition, recognizing the Le Mans successes, was available for 2004. It consisted of a LeMans blue paint with silver / red center striping, Commemorative badges on the front bumper and rear deck (above), a shale interior with seat embroidery, an emblem on the interior waterfall area of the convertibles and a shale convertible top. The Z06 Commemorative Edition came with polished aluminum wheels. 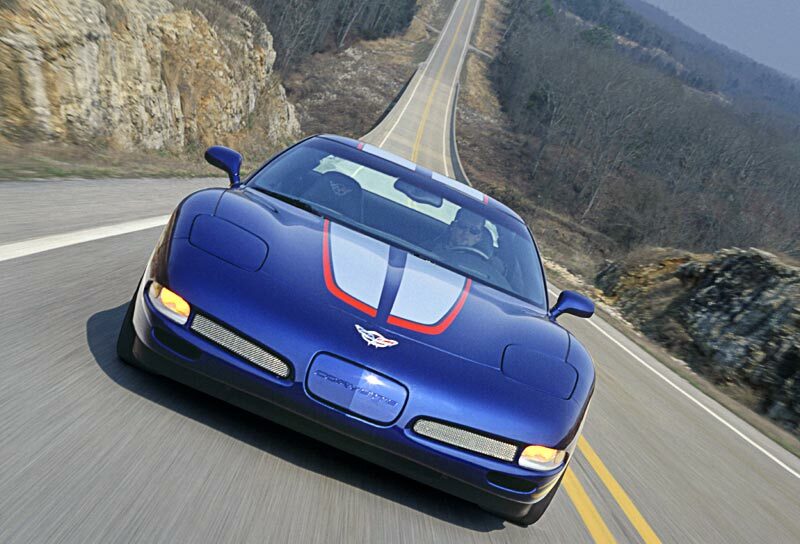 Suspension tweaks improved handling of the Z06 without a sacrifice in ride quality. Notes: Base Corvette Coupe with 346 cu. in. 350 hp engine and four speed automatic transmission: $44,535.00. Base Corvette Convertible with 346 cu. in. 350 hp engine and four speed automatic transmission: $51,535.00. 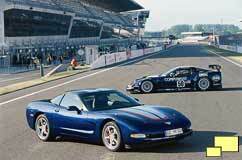 Base Corvette Z06 Hardtop with 346 cu. in. 405 hp engine and six speed manual transmission: $52,385.00. Notes: Code 19, the Le Mans Commemorative edition, included shale interior, silver and red striping on the hood, roof and rear deck. Z06 interiors were black or black with red. Le Mans Commemorative edition convertible roofs were shale only.